Yet another thing that can be recycled is tire. Tire recycling is on great demand nowadays. Let us see what is tire recycling, the reasons for tire recycling, process and benefits. Rubber recycling is as old as the industrial use of rubber. In the early 1900’s rubber cost as much as silver and therefore was valuable. It was good sense to reuse as much of this product as possible. Towards the middle of the 20th century cheap oil imports, use of synthetic rubber and development of steel belted radial tires caused the decline of the rubber recycling. 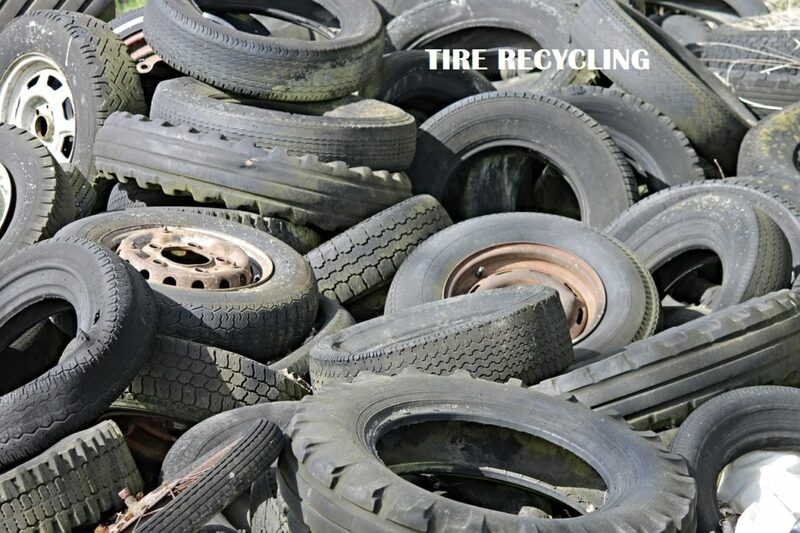 But now the tire recycling industry is seeing tremendous growth thanks to the legal framework that requires the safe disposal of scrap tires and innovative economically viable applications for recycled rubber. Scrap vehicle tires contribute significantly to the bulk of waste generated in every country. Landfills with illegally dumped tires are not an uncommon sight. They take up a lot of valuable space. When these tires accidentally catch fire, the fire burns for several days, sometimes months emitting dangerous smoke and polluting the air. Discarded tires in stockpiles become a home for vermin and breeding ground for disease carrying mosquitoes. Tires are built to be strong and durable. A tire is made up of a mixture of steel, textile and rubber with traces of oil and other chemicals. It is non-bio-degradable. It is also necessary to separate these steel and polyester fibres from the rubber. The basic need in tire recycling is size reduction. The rubber must be processed to a saleable particle size for it to be used for other purposes. The machinery used to shred rubber tires is fairly complex and expensive. The most common machine used is a rotary shear shredder with two counter rotating shafts operating at low speed 20-40 rpm and high torque. Tires are pre-shredded into strip like pieces. Some operators prefer to first split the tire into three pieces and get the steel belted portion of the tire separate from the tread part of the tire. This is done so that the 1 inch thick steel beads can be removed from the tires. De-beading reduces wear and tear of the shredder, granulator and other machines. Finally the parts are shredded to large pieces. As the material is shredded to smaller size in the granulator, magnets are used to remove the smaller steel fibres from them. A combination of shaking screens, wind sifters and low vacuum suction is used to remove the polyester fibres at a different stage. Steel and textile fibre constitute at least 30% of the tire. The residual rubber granulate is crushed to coarse powder (0.6-4.0) mm and is ready to be used in different areas. The same process described above can also be done by subjecting the tire to low temperatures. The process is called ‘cryogenic’ because the temperature here can go as low as -80C -120C. Granulate or the whole tire is cooled to -120C and it becomes glass hard and brittle. It is crushed or ground to a fine size of 50-250 micrometre in special mills. This process requires less energy and less machinery than the regular ‘ambient’ process. It is also easier to liberate steel and fibre from the rubber using this process giving us a cleaner product. A drawback of this system is the additional expense of using liquid nitrogen, the coolant. The high quality rubber product thus formed is used in a variety of industrial and chemical processes for production of compounds and corrosives. Pyrolysis is a thermo chemical process where organic substances are broken down using high temperatures in the absence of oxygen. Tire pyrolysis a method of tire recycling where the residual product is a fuel oil that can be used in industries such as steel, iron and boiler factories, ceramics, power, chemical industries and hotels and in generators to produce electricity. The waste whole tires are put into a reactor and sealed tightly. The reactor rotates slowly. The reactor is slowly heated using coal, charcoal, fuel, gas, wood etc. The rubber softens and the rubber polymers break down into smaller molecules which eventually vaporize and exit from the reactor. The oil gas coming out of the reactor then goes into the condensing system and becomes liquid oil. The residual gas which does not get liquefied is directed back to the combustion system. It is used to heat the same reactor as fuel, thus saving energy. The smoke that is produced during the process can be filtered and treated to remove all pollutants before releasing it into the atmosphere. Hence tire pyrolysis is considered an environmentally friendly manner of recycling tires. When oil production is complete the temperature of the reactor returns to normal. The residue of this process is carbon black and steel wires. The carbon black is used in construction and as a low grade fuel. Recycled or recovered carbon black is treated and becomes a high value product used as filler in the rubber industry, paints and coatings, ink production and other industrial applications. The steel wire is recycled to produce new steel products. Crumb rubber is used as filler in virgin rubber compounds. There is a 5% limit on the recycled rubber that can be used in the new tires. Adding this filler improves the processing by better mixing properties and improved stability form and reduced cure times, to name a few. Sporting surfaces and playground covers – To form an elastic and resilient surface cover, recycled rubber is combined with urethane binder and poured into place. It is gaining popularity for use in running racks, tennis courts and similar athletic surfaces. Moulded products – simple compression moulding is used to make products out of rubber such as rubber paving blocks, livestock mats, railroad crossings, removable speed bumps and gymnasium mats. Devulcanization – This process involves breaking the sulphur bonds in the molecular structure of rubber in order to restore recycled rubber without compromising quality, appearance or performance characteristics. This can be done in a variety of ways – mechanical, thermal, ultrasound and even using bacteria. Rubber Modified Asphalt – RMA road surfaces were introduced in the 1960s and have caught on very fast. This modified road surface is very useful in places with extreme climates i.e. high temperatures in the summer and severe frost in the winter. Its elastic properties reduce reflective cracking and increases durability. Such roads have lower maintenance costs too. Traffic safety is increased due to its better de-icing properties and skid resistance. Construction or civil engineering applications – Tire chips are sometimes used as a substitute for conventional construction material such as road fill gravel crushed rock or sand because of its lower density, improved drainage properties and better thermal insulation. They have been used successfully as lightweight fill for embankments and retaining walls, leachate drainage material and alternative daily cover at solid waste landfills, insulating layer beneath roads and behind retaining walls. Such applications will become more widespread as more applications become more technically and economically viable. Other miscellaneous uses – Wide range of applications such as silo covers, door mats woven from tire strips, handicrafts, shoe soles, playground swings are results of active imaginations. Waste bins made from old tires are seen all over Thailand. Export of used tires – at least 10% of used tires in the industrialised countries is sent to lesser developed countries in Eastern Europe, Latin America and Africa. From an environmental view this is good as the tires are being reused as tires. But on the downside the receiving countries are ending up with a large number of scrap tires. Lack of legal framework and industrial infrastructure may be unavailable to dispose these in a safe manner. Innovations in tire recycling methods and discovering new applications for recycled rubber and its other by products will help the recycling industry to grow at a fast rate. Though the energy recovered from recycling tires is 3-4 lesser than what was expended into making the tire, still the advancements made in obtaining clean fuel is an advantage that countries are making use of. As more applications are discovered, there is hope that one day recycled rubber can be reused for the purpose of making new tires again.